AHDB Beef & Lamb has appointed a new halal sector manager to help the organisation focus on the needs of the halal industry. 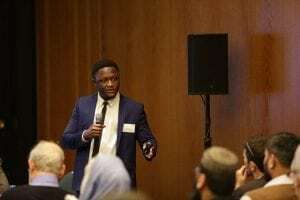 Awal Fuseini, who will join the organisation at the beginning of April, will lead on all AHDB halal work, working with processors, certification bodies and retailers to drive collaboration between AHDB and this increasingly important sector. Awal, spoke at the recent AHDB Beef & Lamb halal seminar on alternative slaughter methods and the relationship with halal requirements. He is currently studying a PhD at the University of Bristol, funded by the Humane Slaughter Association, looking at the development of a new system of electrical stunning of cattle. He holds a BSc in Agriculture from Cape Coast University, in Ghana, and an MSc in Meat Science and Technology, from Bristol University. Prior to his research at Bristol University, Awal was the Certification Manager of Halal Food Authority. Dr Phil Hadley, AHDB head of global supply chain development, said: “Awal joins with a great wealth of experience in the sector and will be key to increasing our activity in the halal marketplace.